Every bloody Australia Day! 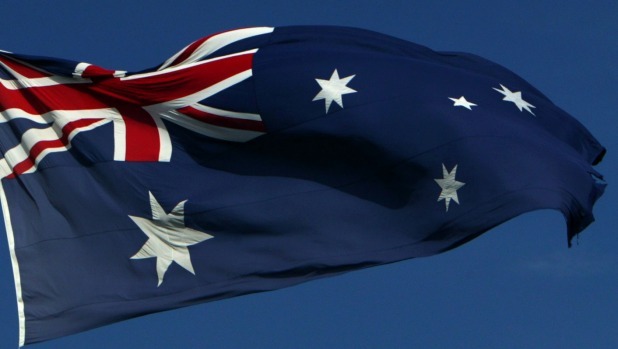 Yet more discussion on why we need to change the Australian flag to something more emblematic of the nation we are – multicultural and cognisant of our Indigenous history – and not the nation we were – Great Britain in the South Seas. What is wrong with people that they think having the flag of another nation as the key feature on our own flag is a tad on the sad side in the 21st century? How unpatriotic can you get? "Our blokes fought for each other, for the Empire, for the country, for the belief that their cause was just. But the idea that the winning entry from a magazine competition in 1901 got them going back then is ludicrous." So this year, let′s not. Let′s take it as given that sensible people can see that the case for change is overwhelming. Instead – in this centenary year of Anzac – let me just raise one quick counter-point to those who always, against change, are seduced by the sophomoric argument that, "our Diggers fought and died for that flag". They didn′t. At least not broadly, not in the Iwo Jima sense, nor in the sense of "the rockets red glare, the bombs bursting in air, gave proof through the night, that our flag was still there". In six books on World War I and World War II, I am yet to come across a passage in any contemporary diary or letter or newspaper account where the Australian flag was remotely significant. In the First World War, the flag we know today was barely known to Australians as a people, let alone soldiers rallying around it. "It is the Blue Ensign," the reporter helpfully pointed out, "with a Southern Cross on the field, made of five-pointed stars and a six-pointed star underneath the Union Jack in the centre." So unfamiliar, even the journo got the description wrong! Of course the flag we have today was not adopted until 1954, at the behest of Prime Minister Menzies. Back on the battlefields of the Great War itself, Australian flags of any description were rarely sighted, and not what it was all about in any case. There was nationalistic fervour, certainly, and I was fascinated to find in researching my last book, that when they landed on the shores of Gallipoli, some really did shout, "Come on, Australia!" But if the Australian flag itself was sighted, it was rare indeed and I never came across reference to it. What I did note was that when Charles Bean and the Diggers needed a cover illustration for the book on their collective stories of Anzac, they chose – what else, but – an heroic image of a Digger charging forward under a large Union Jack! But the whole notion of waving any version of the Australian flag about, on parade, or in battle? It was just not in our blokes′ nature. At the moment your correspondent is doing a book on the battles of Fromelles and Pozieres and came across these two pearls. "We French fight for our country, our ideals and our flag," one of Marshal Foch′s soldiers noted before the battle of Pozieres. "Australians appear to fight because they like to fight." "One never sees or hears anything of patriotic fervour ..." one-time Age journalist Lieutenant Alec Raws would note, before being one of the 30,000 Australian casualties from the British battle-plans at Fromelles and Pozieres. "If the men show anxiety to get to the fighting it is never from any idea of patriotism and loyalty, but only because they are sick of these so-and-so parades." Are there exceptions to these broad truths? Pedants will scramble like mad things to find them, and I wish them well. But they sell the Diggers short. Our blokes fought for each other, for the Empire, for the country, for the belief that their cause was just. But the idea that the winning entry from a magazine competition in 1901 got them going back then is ludicrous. And when the bullets were flying at Lone Pine, Fromelles, Pozieres, Tobruk and Kokoda they were looking after each other, and at the enemy, without an eye on a piece of cloth.